Produce Kanu or face ar, IPOB warns – Royal Times of Nigeria. The banned Indigenous People of Biafra on Monday threatened to take up arms against the Federal Government of President Muhammadu Buhari if it failed to produce its leader, Nnamdi Kanu, dead or alive, on Tuesday (today) in court. 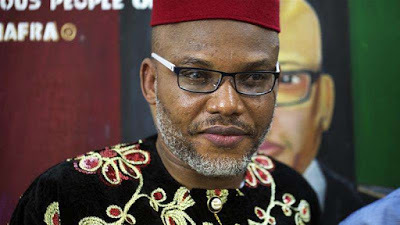 Kanu who is facing treason charges, was granted bail in April, with an order to return to court to face his trial before Justice Binta Nyako on October 17. IPOB, in a statement on Monday, made available to Punch correspondent in Awka, Anambra State by the group’s Media and Publicity Secretary, Emma Powerful, said it was gradually losing its patience with the Nigerian government. The statement read in part, “The barefaced lies of the Nigerian Defence Minister, General Mansur Dan Ali, and that of the Buhari regime against our leader and organisation is beginning to unravel before the eyes of the world. “By admitting publicly that soldiers were sent to Isiama Afaraukwu to look for our leader without any order or warrant from a court of law confirms the contempt in which the Nigerian government holds the rule of law and their judicial process.